For more than twenty years, Karen’s speaking voice has been heard on literally thousands of television and radio commercials. 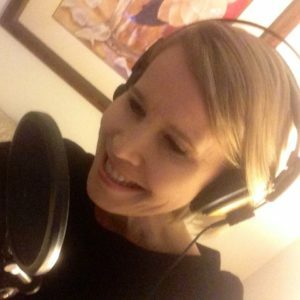 Initially singing jingles in studios in Brisbane and Sydney, Australia, her many Voice-Over clients have included top national and international brands, IVR and long running advertising campaigns. In 2002 things changed in ways no-one could have anticipated. Karen was asked to audition for a text-to-speech voice system. The client was looking for a native Australian female voice-over artist living in the North-East of the United States. The Only Woman Men Will Take Directions From! Karen booked the job, and recorded for 50 hours in the studio to create a voice system now heard in over 400 million GPS and smartphone devices around the world. As a member of the Screen Actors Guild – AFTRA, Karen’s voice has been heard on national commercial campaigns in the USA, and in many customized voice systems around the world. and once even in a car wash.
Voted the number one downloadable voice in the world, Karen is in demand to create custom voice systems for clients internationally. Is Aussie Karen’s voice available for you? Absolutely. Realizing there was a brand to be created, Karen trademarked The GPS Girl® combining her GPS fame with her love of personal development. Featured at SAG Foundation Voice-Over Industry events in New York City and in demand for customized voice systems, being in the recording studio is second nature. Together with New York Voice-Over Artist and Coach Joan Baker, Karen created a five module Voice-Over Business Building Course; Creating a Road Map for Voice-Over Success. For more information visit the Store.